Dear Valued Customers, Business Partners! Thank you for visiting Bin Holdings Ltd website. 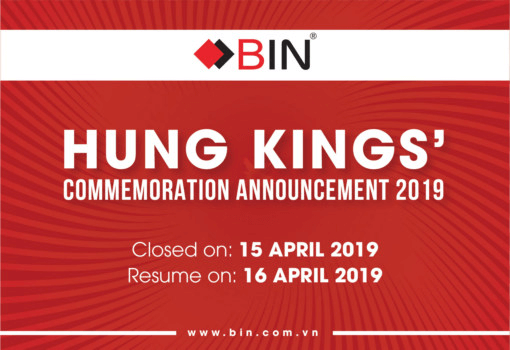 We would like to inform you that our office will be closed on Monday, 15 April 2019 for Hung Kings’ Commemoration Day ( the 10th day of the 3rd lunar month). Normal business will resume on Tuesday, 16 April 2019. Although our office is closed, you may contact us by email hr@bin.com.vn, we will reply you as soon as possible. We - Bin Holdings Ltd hope you enjoy a wonderful holiday filled with lots of happiness. BIN HOLDINGS LTD provides the necessary internal news for employees.